The longevity of our company’s existence speaks for itself. We’ve been assisting our clients with their printing needs since 1939 – that’s a 79-year commitment. Through these years of hard work and dedication, our company has received ISO Quality Management Accreditation. This serves as further evidence that we are committed to maintain the highest production standards. We will never stop reminding you that we strive for excellence in everything we do. You can be rest assured that our team of highly skilled professionals will get the job done and the finished product will be nothing but quality. We take pride in the way in which we take care of our clients’ business, without demanding a price that is more than expected. Which is why we match our services with cost-efficient packages and know you can be confident that you will get what you pay for. Our commitment does not end at the printing process. Abbott & Co Printers extend its commitment by delivering our finished products in a timely manner. We know you’re busy, so we don’t do delays; we guarantee your satisfaction and our past clients will tell you the same! As well as caring for our clients, we care for the environment too. We are a member of the Green Stamp Program established by the Printing Industries Association of Western Australia in conjunction with the Department of the Environment. This program helps businesses in the printing industry with the correct disposal of waste materials and we are pleased to inform you that we have achieve the highest level attainable, with the Level 3 Certificate. In addition, our company had the honour of receiving the Environmental Award given by the Local Chamber of Commerce and Industry for the year 2012, along with the City of Belmont Environmental Award both in 2008 and 2013. With a team consisting of highly-skilled, friendly and passionate individuals, we are able and dedicated to provide nothing but effective solutions for your business needs. 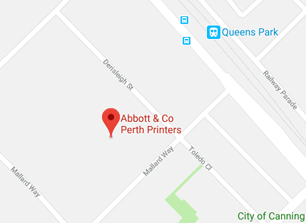 By employing the printing industry’s cream of the crop, we can guarantee you that Abbott & Co Perth Printers can deliver satisfying results when it comes to printing services in Perth.